Moves. Your favorite bartender may have moved over the summer: as of press time, you’ll fi nd Michelle McMahon and Ryan Asay at Lucky Rooster, Paul Gustings at Broussard’s, Sharon Floyd at SoBou, Laura McMillian at the J.W. Marriott, and Jeremy Thompson back at Booty’s. Rye whiskey & rock candy, revived. My fi rst shot of rock & rye came after spinning a boozy wheel of fortune in a Bywater warehouse, but imbibers were guaranteed a taste July 1 at the Saint, when Hochstadter’s Slow & Low launched nationally. Rock & rye has its roots in 19th-century saloons, when Americans high on domestic rye would get it blended with strands of rock candy. By 1884, a bottled version appeared, and this is the family recipe on which third-generation distiller Rob Cooper has based his Hochstadter’s Slow & Low: amber, aged rye whiskey blended with rock candy syrup and infused with honey, orange peel, and horehound candy, which acts as an herbal, bittering agent. 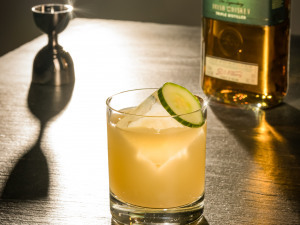 As a vintage recipe and one easy pour (take it chilled and neat), Slow & Low “bridges the gap between craft cocktail and high-volume bars,” said Ali Mills, a brand rep for Cooper Spirits and bartender at the Saint. She’s also a founder of Dash & Pony, the speakeasy set up in that warehouse, where I got a lucky spin of the wheel. Also launched…Atelier Vie’s young rice whiskey, as well as their green absinthe made with locally grown wormwood. Bayou Rum, based in Lacassine, has also released its silver and spiced rums. Meanwhile, I’m lingering over the Kingfi sh cocktail list—there are local classics (no surprise that the bar earned this year’s Seal of the Sazerac), modern concoctions (like Tony Abou-Ganim’s spiced rum Cable Car) and originals (Chris expects his staff of bartenders to eventually add their own). Which drink best sums up Chris McMillian, a fourth-generation bartender who so impressed Dale DeGroff behind the bar that Dale asked him to help launch the Museum of the American Cocktail? Sensing my confusion, Chris mentions his stash of rose syrup, courtesy of chef Mary Sonnier (wife of Greg, Kingfi sh executive chef), made from roses in their backyard. Yes, yes. 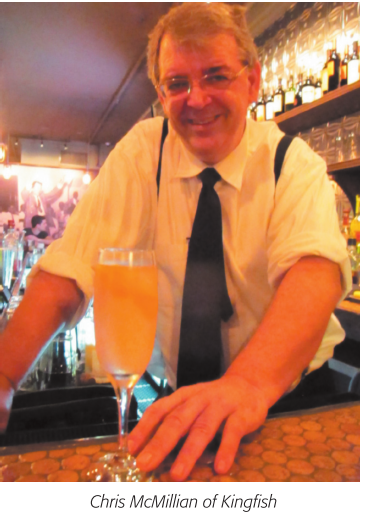 Chris pairs the lush rose syrup with gin and sparkling rosé, which provides “a bit of cannon,” he says. A thick orange twist adds aromatics to this fl oral and softly boozy sipper. We chat, then Chris tends to other customers as they drift in on a late night. When he comes back to me, he has one question: “Do you like mezcal?” Maybe I squinted; for sure I hesitated (for me it’s been an acquired taste). “Okay, then,” he says, and makes up something else off the menu. I assume it will have mezcal, and that he will convert me for good. What I get is a play on the Paloma, dolled up with grapefruit vodka as the sweetener. Chris adds to it young tequila (I’m increasingly looking to Don Julio, used here, as my tequila of choice), fresh-juiced lemon, and Ruby Red grapefruit. The earthy agave grounds the tartness, giving this sour a beautiful complexity. I may not have known what I wanted, but Chris, a master host, gave it to me. Chris McMillian’s wife, Laura, is the assistant managing director of MOTAC, and both sit on the board. Speaking of the Sazerac Seal…this year, the New Orleans Culinary and Cultural Preservation Society’s undercover scouts gave the nod to Sazeracs made at Cane and Table, Cocktail Bar at Windsor Court, Galatoire’s 33, Ruth’s Chris Steak House, Twelve Mile Limit, and Kingfi sh Restaurant. Better memories of a Long Island Iced Tea. Nothing brings me back to college, as a student and as a bartender, like a Long Island iced tea. That fi ve-spirit fright is responsible for the worst hangover I (somewhat) remember; behind the stick in Virginia, I couldn’t legally serve more than one at a time. Run down the classic recipe, and you’ll see why: a towering 2 ounces each of white rum, tequila, vodka, gin and triple sec, squirted with lemon juice and a splash of Coke that was more for color than anything else. I’d never had it made by a master, so I asked Cole Newton at Twelve Mile Limit to build one for me. “I sell a few Long Island iced teas a week,” he says. His method? A half-ounce each of the spirits, balanced by simple syrup, and an ounce each of Coke (“it has acidity, effervescence, citrus; a good mixer,” he says) and fresh lemon juice. “That’s the value of fresh juice, in a cocktail that would have been dismissed,” says Cole. For sure, his version is crisper, with a more muted sourness and a rum-forward quality, all of which I’d overlooked in school. The lesson’s easier learned this time around. And there’s a new list: classic New Orleans drinks and champagne cocktails, bottled cocktails, a vodka and caviar tray, and a signature campy go-cup. The Gator Death Roll is a twist on a Trader Vic classic made with local white rum, herbal and cherry liqueurs, fresh lime juice, and coconut water that’s on tap, served in a rubber gator cup. In a swankier mood? Cheryl offers Bourbon Street’s take on bottle service, with champagne cocktails that you’ll make tableside. A setup comes with iced bubbly, fl utes or coupe glasses, fresh fruit and pour-ready mixers (your choice of ginger-orange juice, peach and black currant liqueurs, blueberry vodka and blue curaçao, or the classic sugar cube and shakes of bitters). In keeping with a speed bar, the setup takes about two minutes, and can keep guests sated for an hour or more. And Cheryl’s all about giving customers what they want, no matter which door they enter. “If they want Jäger shots, give ‘em Jäger shots… and ring them up,” she says. Read Anne Berry's weekly cocktail blog, In The Drink, at WhereYat.com. Bourbon “O” Bar at the Bourbon Orleans: 717 Orleans St.
Cane and Table at Pravda: 1113 Decatur St. Cocktail Bar at Windsor Court: 300 Gravier St.
Galatoire’s 33: 215 Bourbon St.
Kingfish restaurant: 337 Chartres St.
Lucky rooster: 515 Baronne St.
Ruth’s Chris Steak House: 525 Fulton St. The Saint: 961 St. Mary St.
Twelve Mile limit: 500 S. Telemachus St.